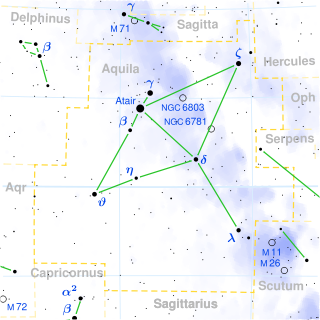 Ara is a southern constellation located between Scorpius and Triangulum Australe. 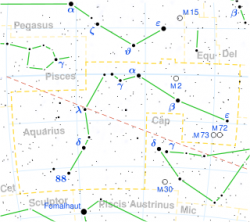 It was one of the 48 Greek constellations described by the 2nd century astronomer Ptolemy, and it remains one of the 88 modern constellations defined by the International Astronomical Union. Ara is a Latin word meaning “altar”, but its mythology comes from ancient Greece. Ara was identified as the altar, made by the Cyclops, where the gods made offerings and formed an alliance to fight the Titans. 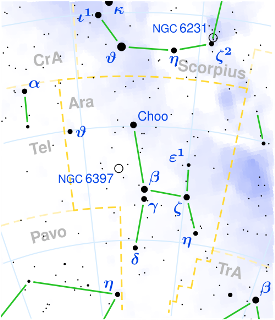 Beta Arae (β Arae) is the brightest star in the constellation. It is an orange K-type bright giant or supergiant with an apparent magnitude of +2.84 and located 603 light years from Earth. Gamma Arae (γ Arae) is a blue-white B-type supergiant with an apparent magnitude of +3.5. It is approximately 1140 light years from Earth. Mu Arae (μ Arae), often referred to by its designation in the Henry Draper catalogue HD 160691, is a main sequence G-type star about 50 light-years away from Earth. The star has a planetary system with four known planets, three of them with masses comparable to that of Jupiter. The system’s innermost planet is equivalent in mass to Uranus and orbits its star on a tight 9-day orbit. This schematic compares the orbits of the outer three planets in the Mu Arae system with those in our solar system. The central star is not to scale. 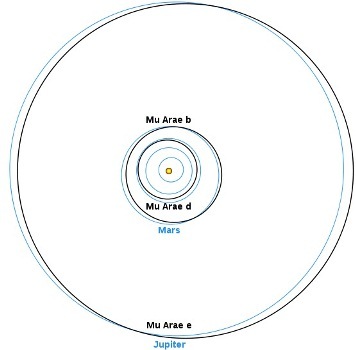 In fact, at the scale of this picture, the innermost planet would be located at the edge of the disc representing the central star. Other notable stars in the constellation with known exoplanets are: HD 154857 (one confirmed planet and another one still unconfirmed), HD 154672 and Gliese 674 (one confirmed planet each). 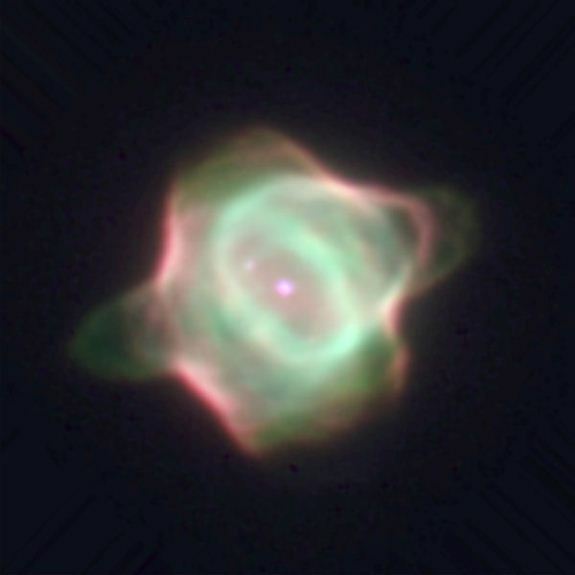 The Stingray Nebula (officially designated Hen 3-1357) is the youngest known planetary nebula. In fact, forty years ago it was still a protoplanetary nebula in which the gas had not yet become hot and ionized like in other nebulae. It is located 18,000 light-years away from Earth. 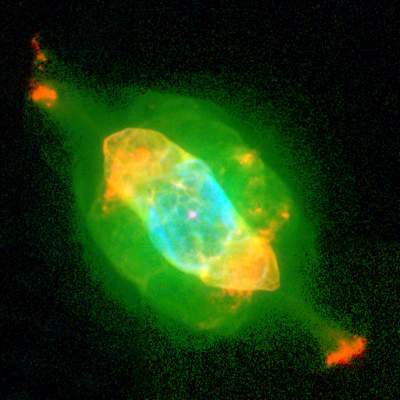 Image Credit: Hubble Space Telescope (NASA/ESA) and M. Bobrowsky. 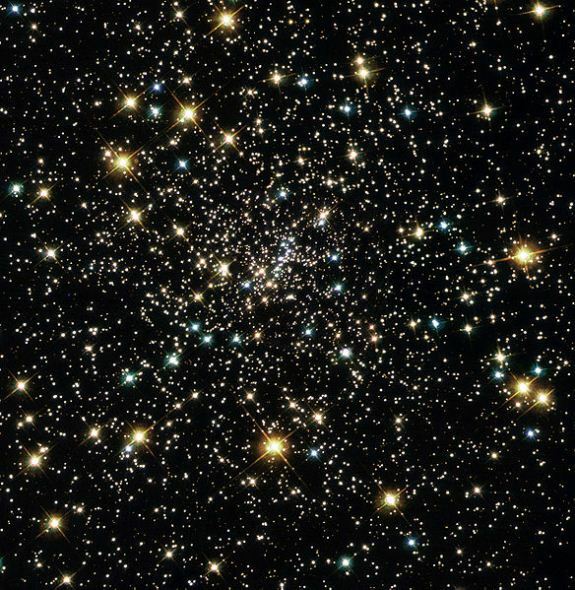 NGC 6397 is a globular cluster located about 7,200 light-years from Earth, making it one of the two nearest globular clusters to Earth. It contains around 400,000 stars. The cluster has undergone a core collapse, meaning that its core has contracted to a very dense stellar agglomeration. Image Credit: Hubble Space Telescope (NASA/ESA). For more constellations see the Constellations Guide.